From Paul McCartney--an action-packed picture book adventure celebrating the fun that grandparents and grandkids can get up to. See the compass needle spin--let the magical fun begin! 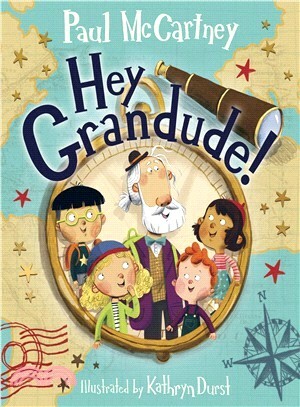 Meet Grandude--a super-cool intrepid-explorer grandfather with some amazing tricks up his sleeve. Grandude is a one-of-a-kind adventurer! With his magic compass, he whisks his four grandkids off on whirlwind adventures, taking them all around the globe. Join them as they ride flying fish, dodge stampedes, and escape avalanches! Brought to life with gloriously colorful illustrations from talented artist Kathryn Durst, it's the perfect bedtime story for little explorers. Since writing his first song at the age of 14, Paul McCartney's career has been impossibly prolific and singularly influential. In the 1960s, Paul changed the world forever with The Beatles. He didn't stop there, and has continued to push boundaries as a solo artist, with Wings, and collaborating with numerous world-renowned artists. He has received 18 Grammys, and in 1996 was knighted by H.M. The Queen for his services to music. Paul's most recent album Egypt Station was his first-ever album to debut at #1 on the Billboard charts. Paul is a dedicated philanthropist, passionately advocating for many causes including animal rights and environmental issues. He's also a very proud grandfather. Kathryn Durst is a graduate of Sheridan College in Ontario, Canada. With a background in animation, she has interned with Pixar Animation Studios in addition to working with various children's book publishers. When she is not illustrating books, she may be found playing the accordion, growing vegetables, folk dancing, or putting on shadow puppet shows. She lives in Toronto, Canada, with her grumpy mini daschund named Chili Dog.